Amazon.com description: Product Description: This book constitutes the refereed proceedings of the 8th International Conference on Advanced Data Mining and Applications, ADMA 2012, held in Nanjing, China, in December 2012. The 32 regular papers and 32 short papers presented in this volume were carefully reviewed and selected from 168 submissions. They are organized in topical sections named: social media mining; clustering; machine learning: algorithms and applications; classification; prediction, regression and recognition; optimization and approximation; mining time series and streaming data; Web mining and semantic analysis; data mining applications; search and retrieval; information recommendation and hiding; outlier detection; topic modeling; and data cube computing. 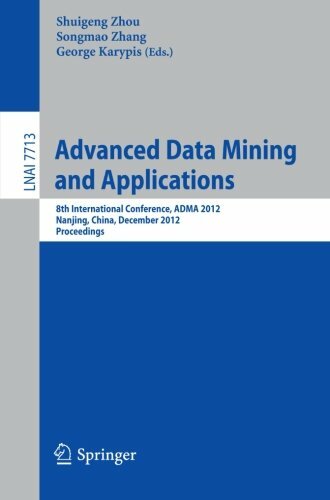 About: This book constitutes the refereed proceedings of the 8th International Conference on Advanced Data Mining and Applications, ADMA 2012, held in Nanjing, China, in December 2012.